Searching for that perfect gift for a hard-to-buy person on your list. Give an Amazon.com gift certificate. Click through below. Each purchase helps support Spiritual Woman! Thank you! "As he was walking by the Sea of Galilee, he saw two brothers, Simon who is called Peter, and his brother Andrew, casting a net into the sea; they were fishermen. He said to them, 'Come after me, and I will make you fishers of men.' At once they left their nets and followed him." As I read this Bible passage this morning, I was amazed at the speed with which Simon and Andrew answered the call from Jesus. I have read this passage many times, but for some reason today that fact struck me with force. They just went. A total stranger came up to them and told them to follow and they did. They gave up their way of life and all that they have. We know St. Peter was married. Can you imagine that conversation when he came home? And yet, they followed. Answering Jesus' call requires sacrifice and sometimes, I admit, I'm not always that willing to make it. I admire the single-mindedness of Peter and Andrew. I admire their willingness to do whatever He asked. It reminds me of the cost of discipleship and it gives me something to aspire to. let the plains be joyful and all that is in them!" It can be hard to be joyful. Sometimes it seems like there is so much in life to weigh us down. But, if you really look, you can find joy in the simplest moments of life. Tonight David and I went out for a walk in the chilly evening. All bundled up in our hats and coats and mittens, David began singing Christmas songs and I joined along. We had so much joy just walking along singing! Sometimes a joyful moment can take you by complete surprise! It's Christmas-list time again. My children have had theirs made out since the summer. I think they actually had me put every item in the "Thomas the Train" catalog on it! I used to do the same thing as a child. When the Sears "Wish Book" would come out in August, I would spend days out in the back yard studying the pictures and descriptions, making and revising my list a hundred times. I never got everything on it, and neither will my children, but that didn't matter. It was the dreaming that was fun. There are still things that I would like to get for Christmas, although my life would certainly go on without them. I let my husband know I could use a couple of sweaters. My best friend asked for some suggestions and I told her I would like a new journal or a subscription to a favorite magazine. I could also use a new Bible. The much-loved one I own is worn out from use. The pages are literally falling out! Still, it is like an old friend and I can't bear to replace it yet. Maybe next Christmas. Really though, I think that as we get older, we are much less likely to have things on our Christmas list. It's not that we don't want or long for something, it is just that those "things" don't come from a store. Some of us may long for love, a special someone to share life with. Others might long for a child. We might be searching for direction in life, a physical or spiritual healing, a new job, or a repaired family relationship. Everyone has some desire deep in their heart that only God can fill. Last year, my mother told me about a special Christmas novena. She had said it when she was pregnant with me. I was in breech position and she was praying for me to turn around. She went into labor on Christmas Day (two weeks early) and I had turned around. I was safely delivered the following morning. I made the novena last year and did receive the answer to my prayer. Granted, the answer didn't come the way I expected it to, but the answer came, and it came on December 23rd. I invite you to make this novena this Advent season. The traditional days for it are December 16 - 24. Bring your deepest longings to God. Let God know what you want most for Christmas this year. I just updated my Christmas section on the website. 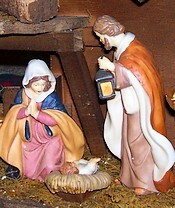 Check out the following articles for help on keeping the focus of Christmas where it belongs. I just posted a new review of Israel's Story, Part One by Dianne Bergant. As I was reading this book, I felt like I was reading "Cliff Notes" for the Bible. It was a very good overview of the first half of the Old Testament, useful for someone just getting into reading scripture or who wanted to have a better idea of how all the pieces fit together. The Catholic Faith Handbook for Youth . They are written especially for teens. Tonight, Bernie and I took the boys to Winterfest at The Connecticut Trolley Museum. What a fun time we had! We actually got to go on a real train tride - the first time for all of us. It was an old restored train and had vintage advertisements from the 1950s lining the upper panels. It was only a 3 mile ride but that was just about right for the kid's attention spans. After the ride, we went to the visitor's center where they had about 8 or 9 model railroads set up. Santa was there as well and both boys went to go see him to tell him that they want trains for Christmas. The whole thing took only about an hour, but what a great time it was. The boys are at such a perfect age for Christmas. They understand the religious significance and are both looking forward to being in the Christmas pageant at Church (this will be Isaac's first year). At the same time, they still believe in magic and are so full of wonder for all the decorations and Santa. I really wish I could freeze time and keep them right where they are! Instead, I have to be happy cherishing the memories. Tonight was a good one. Our Thanksgiving was good. One thing that I have noticed is that I have started remembering holidays by the developmental stage my children are at. This year they actually sat at the table during dinner and ate like human beings! I considered that quite a development. They didn't stay for the whole dinner, but once they were done, they went to play by themselves for a few minutes until the rest of us were finished. Today was putting up the Christmas decorations day. I love having the decorations up - it always makes the house look happy and the boys were so excited about helping out. 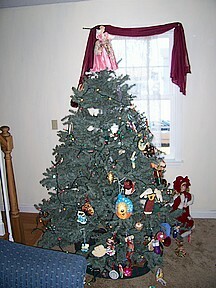 As you can see from the picture, our tree is definitely bottom heavy with ornaments, but I think it is beautiful. Every ornament tells a story, and each year something new is added to the tree that will add to our family's history. As we put up the ornaments, I was telling the boys the story of each one. Some of them they had made last year and the year before so they were especially excited to put those up. David also decided he wanted to put lights on his gymset in the back yard, so now we have lights both in front and in back so everywhere you look you see some Christmas spirit! I love this time of year. Every Thanksgiving at mass, my Church sings the following song. I have a copy of it on my refrigerator and I thought I would share it with you with warm wishes that you all have a very happy and peaceful Thanksgiving. May dwell, O Lord, with Thee. Tonight was the annual packing of the Thanksgiving baskets at my Church. The amount of food that had been collected was truly astounding. It was so wonderful to see all these people from age 5 to age 90 coming together to pack up this food for the needy in our community. We packed 107 baskets with some food left over for our food pantry which runs year round. Every night before bed, I ask my children what they want to thank God for that day. Most of the time there was something good in their day and they find it pretty easy to come up with something; sometimes they can come up with several things. Other days, however, they look at me with a sour puss on their faces and say "Nothing! There was nothing good about today." Admittedly we all have bad days, even little children. On those days, I have to help them dig a little deeper to find something to be thankful for. I want to help them have thankfulness as part of who they are, and to realize that thankfulness is as important a part of prayer as is petition or saying "I'm sorry" for things they did wrong. Sometimes, I need to take my own advice in the thankfulness department. God gives us so many blessings, yet I admit I often take them for granted. Even worse, I often look at other people's blessings and want them for my own! Ah, yes, that "You shall not covet" commandment has always been the one that has given me the most trouble. In the list of the seven deadly sins, envy has always been at the top of my list. From the time that I was child, it has always seemed like there is someone in my circle of friends who has life so much better than me. Those people have changed over the years and the reasons I feel envious have changed as well. Thankfully, I have outgrown my adolescent envy of those more attractive or more popular than I! By the same token, I no longer feel jealous of people with nicer homes, nicer clothes, or more fancy cars. These days, my envy is much more likely to be of other people's interpersonal relationships. I see others who seem like they are better moms or have apparently happier marriages or have deeper spiritual lives. I try to channel my jealousy into a positive thing by looking at these people's lives and seeing how I could nurture those qualities in my own life. I try to pick up tips on parenting or marriage or prayer and implement them. Sometimes this helps. What I really need to do, however, is to be thankful for what I do have. I have lived long enough to know that no one's life is perfect. We each have our own challenges to deal with, even if they go unseen to the rest of the world. In my more lucid moments, I even realize that there may be people out there who look at me and think that I have it made! I have been blessed in many ways. I have a loving husband and two beautiful children. I have a roof over my head and food on my table. My health is good. I am lucky enough to live in a place where I am free to worship as I choose. Yes, I have been truly blessed. Each day, I need to remind myself to thank God for all those blessings - the big and the small - that have come my way. Sometimes it is hard to keep praying for something when no answer seems to be forthcoming. It is frustrating when our sense of time comes in conflict with God's sense of eternity. We want answers and want them now. God often seems to take a much more leisurely view of the situation. Yet, in this parable of the widow who keeps badgering the judge until she gets the response she is looking for, Jesus tells us to keep the faith, to keep persisting, to keep asking. God will answer, when the time is right and in the way that does us the most good in terms of our eternal souls. In the meantime, prayer helps align our wills with God's will. It gives us acceptance and patience. I have a soft spot for Sophia Institute Press. Back in late 2003, I was searching for a publisher for my manuscript of Letters to Mary from a Young Mother . On December 31st of that year, I received an email from them saying that they were interested. Although they ultimately decided not to pursue publication, just the fact that they were interested gave me such hope and encouragement at a time in my life when I desperately needed it. Now, that press may have to close. One of the best books that Sophia Institute has put out is Angel in the Waters . You can read it online at www.angelinthewaters.com This is such a wonderful story of a baby in the womb and his guardian angel. My children love the story and ask to read it again and again. Sophia Press is asking that you consider purchasing a copy of this book for yourself or to give as a gift to a youngster or perhaps to donate to the religious education program at your parish. They are also accepting donations at www.sophiainstitute.com/donate.htm . They are asking for any donations, even $1 helps. Please consider either buying a copy of Angel in the Waters or donating. It is a hard road out there for Catholic publishers and we need to give them all the support we can. This afternoon I took the boys for their weekly visit with my mother-in-law. I didn't have to go to work, so I indulged and took a little time for myself. First stop was the mall - AC Moore is having a 40% off sale on Thomas trains this week (which David and Isaac love) and with Christmas right around the corner, that was way too good a bargain for me to pass up. Next stop was the Mt. Holyoke College library. I hadn't been inside that library in years and it is a place I love. It is architecturally beautiful, plus I just love libraries - all those books just waiting to be read! I did sit down and do some work on an article I have to finish, but I left myself 20 minutes to just explore. I browsed some of the stacks and wandered up and down staircases to see what was beyond the next bend. I love to learn, and truly, there were so many books that if I had all the time in the world, I would love to read. So, I got to thinking. Maybe in heaven we get to keep learning, except with the greater understanding that comes with eternal life (who knows, maybe calculus will actually make sense to me :) ) . After all, all this knowledge comes from God in the first place. Maybe in my eternity, I'll get to read all those books and talk to the authors and learn all I want about art and literature and music and history! That would be my kind of heaven! My nephew has been admitted to a psychiatric ward at a local hospital and will need some surgery to correct the damage he did to himself. As it turns out the anti-depressant drugs he was given increased his suicidal tendencies, leading his doctors to believe that he is actually bi-polar (his father is as well). My sister is a wreck, understandably so, but today, I have calmed down and been able to pray. Thank you for all of your prayers as well. This was sent to me today as one of those emails you are supposed to forward on to a certain number of people. I didn't do that, but St. Therese is one of my favorite saints and this is a good prayer for all of us so I thought that I would share it with you. love. It is there for each and every one of us. I have often found in my life that at the times when prayer is most needed, I find it most difficult to pray. Tonight, my nephew is in the hospital for attempted suicide. Thankfully, he did not succeed and his prognosis is good. My sister is trying to arrange for him to be admitted to a psychiatric hospital for a while. Obviously, if there was ever a time for prayer, this is it, and yet, I found it so hard to find the words. I found it hard to go to my trusted prayer cards and pray. Ultimately, I forced myself to because I knew my sister was counting on me to do that. This is not the first time this has happened to me. In labor with my children, I wanted so much to pray but couldn't; when David was in the hospital for his allergy attacks and when Isaac was diagnosed with lead poisoning, at the spur of the moment, the desire was there but the body failed to cooperate. I think as adrenaline kicks in, the ability to pray leaves me temporarily. And yet, maybe, wanting to pray becomes in itself a prayer. God knows I'm reaching out even if my words and thoughts are absent. And maybe, that is why praying for others when you know they are hurting is so important. Sometimes, when you are too close to a situation, its nearly impossible to pray yourself, but you can ask others for prayer. In the Great Commandment, Jesus tells us to love God and to love our neighbor as ourselves. Sometimes, loving God seems to be the easier part of that mandate. While loving God and maintaining a relationship with a God who often seems hidden can certainly be a challenge, loving the person standing in front of us can be even harder. We often love our neighbors in the abstract. We can give food to food banks and money to homeless shelters. These are good things to do. But what do we do when confronted by a beggar on the street, or when someone sits next to us in church who hasn't showered in a while? How do we respond when we are confronted with the realities of poverty among us? What about the people we work with? It can be difficult to love a supervisor or a co-worker whose goal seems to be to make our own life miserable. What if there is someone who has spread malicious gossip about us? What if someone has let us take the blame for her own error? Then there are the people in our own families. Sometimes it is hardest to love those that we are closest to. We know their faults and they know ours. Our spouses may grate on our nerves. Our children may be in the midst of rebellion. Our parents and siblings may still treat us like we are children. Especially at holidays, old battles can be re-fought and old wounds re-opened. How can we respond with love when we feel like we are coming under attack? Yes, the mandate to love is quite a challenge. Jesus asks us to put other people first. He asks us to see God within those around us, even in situations when that is most hard to see. Jesus asks us to give of ourselves, to reach out to our neighbor in need, whether that neighbor lives under our own roof, or spends their days in the cubicle next to us, or panhandles us on the street. Jesus asks us to love as He loves - a tall order to be sure, but Jesus does not ask the impossible. We all have God's love within us and the capacity to share that love. We can smile. We can share what we have. We can offer a kind word. In doing so, we can begin to plant seeds of love around us. We can begin to respond to the challenge. This was sent to me today by a dear friend. I know that keeping a positive attitude is one of the things that challenges me, so this provided a good reminder. We can all learn a lesson from this great old girl! "Mrs. Jones, you haven't seen the room. Just wait." "That doesn't have anything to do with it," she replied. "Happiness is something you decide on ahead of time. Whether I like my room or not doesn't depend on how the furniture is arranged... it's how I arrange my mind. I already decided to love it "It's a decision I make every morning when I wake! up. I have a choice; I can spend the day in bed recounting the difficulty I have with the parts of my body that no longer work, or get out of bed and be thankful for the ones that do. Each day is a gift, and as long as my eyes open I'll focus on the new day and all the happy memories I've stored away just for this time in my life. Old age is like a bank account .you withdraw from what you've put in. My children slept until 7 am this morning. This is virtually unheard of! So this morning I am thanking God for a wonderful night's sleep. I was standing in line at the grocery store today. As usual the magazine racks in the check-out aisles were full of gossip rags. Everywhere I looked I saw famous faces looking out at me with headlines proclaiming the latest divorces, weight battles, marital indiscretions, hook-ups and more. I must admit, I don't understand the attraction. Why do people spend so much time (and money!) caring about other people's lives and relishing in whatever misfortune has recently come their way. I feel badly for the celebrities, who after all, are people, too. It must be incredibly painful to have your personal life out there for the world to see. But I also feel badly for us as a people, that gossip has become the national pastime. What if as much time and energy was devoted to developing our sense of spirituality? What if we said nice things about other people instead of trying to ruin people's reputations? What if we held up people of faith as role models rather than people who just happen to have money? What a different world this would be. I just posted a new review of Becoming Who You Are by Fr. James Martin. I apologize for not blogging much this week. I've been buried in design work and life in general. In the U.S. November 11th is set aside to remember those who have served in our armed services. In my own family, both my father and father-in-law are veterans, and my nephew is currently serving in the Navy. David's school did a brief program today honoring Veterans in our parish. On the back of the program was a beautiful prayer. I thought I would share it with you. My country may ask of me. My country needs me too. While I do what I must do. Fr. Gary Dailey, the vocations director for our diocese, came to speak at the Children's Mass this morning. Ironically, he wasn't there to speak to the children, but rather to the parents. He spoke of the importance of the call from God that we each receive. We are each called to our state in life, married, or single, or the consecrated religious life. Our children are being called as well. Fr. Dailey challenged us to be open to our children answering the call to religious life. God is continuing to call young people to serve, but that call is often drowned out by the definition of success that is so prevalent in the world today. Parents want their children to be successful. Teachers want their students to be successful. The success that is so sought for is often equated with the amount of money one can make. Even those who are open to low-paying service professions such as teaching or social work often can't envision their children as dedicated religious. Yet, a parent's influence can be so important as a child struggles to discover what God wants for him or her. A parent can offer guidance and encouragement and offer a counterpoint to a world which places little value on service and sacrifice. If a child has even the slightest inclination to religious life, parents have the responsibilty to help them pay attention and at least explore the options available. We also have a responsibility to point out positive role models in the religious community. Religious sisters are not as common as they once were. Catholic schools and religious education programs are often staffed fully by lay people today, but point out those that do take an active role in the parish community. By the same token, one can also talk about the various roles that a priest has and how important it is that there continue to be priests to perform such important sacramental and ministerial functions. Is it a sacrifice to have a child enter religious life? Of course. It may mean giving up the dream of watching grandchildren grow up. It may require a radically different picture of your child's future than the one you had envisioned. But just as God calls young people to religious life, God also calls their parents to be willing to give them up to God's service. If you hear God calling your child, will you answer the call? For more information on vocations, visit www.vocationsplacement.org or contact the vocation director for your diocese. If you are searching for a religious gift this Christmas season or some spiritual inspiration to help you prepare for Christmas, please visit the Spiritual Woman Religious Giftshop. Through our affiliation with Aquinas and More Catholic Goods, every purchase helps support Spiritual Woman. I have selected some gifts that I thought were particularly good to feature on my site but there is always a search box for you to search their full collection. Also if you plan to shop from Amazon.com this season, please consider clicking through from our site. You can purchase anything once you get to Amazon, but purchases must be made within 24 hours after clicking through from our site for a commission to be credited to us. Today is the day we celebrate all those in heaven. At David's school today, the eighth graders dressed up the Kindergarteners as their patron saint and gave a short presentation on who they were. David was St. David, patron saint of Wales. His big buddy worked really hard on David's outfit. It was so wonderful to go to mass this morning and see David and his big buddy. There was such a great spirit in the Church!